It is often the tipping point. The point at which a prospect becomes a paying customer. In the Adweek Copywriting Handbook, legendary copywriter Joseph Sugarman presents an interesting tactic. He calls it a “satisfaction conviction”. 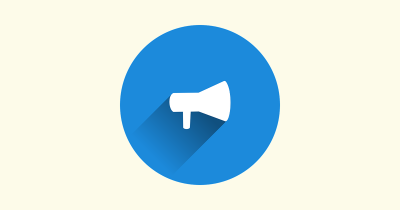 “…conveys a message from you to your prospect that says, “hey, I’m so convinced you will like this product that I’m going to do something for your benefit to prove how incredible my offer is”. This isn’t just your average 30-day money back guarantee. A satisfaction conviction takes a lot more risk. The essence of a satisfaction conviction is risk reversal. It’s where you demonstrate your absolute belief to customers by putting yourself on the line. And here’s the test. You’ll know you’ve got it right when your satisfaction conviction makes you feel uncomfortable, even a little sick because the pressure is suddenly on you. If you risk something tangible that shows you have complete conviction in your offer, you build trust and make it safer and easier for a customer to buy. Your satisfaction conviction should differentiate you from your competitors. The right one could ensure your customer picks you over anyone else. By creating the tipping point that pushes your prospect over the edge, your conversion rates will increase. If you’d like to see powerful satisfaction convictions in action, check out these three examples. 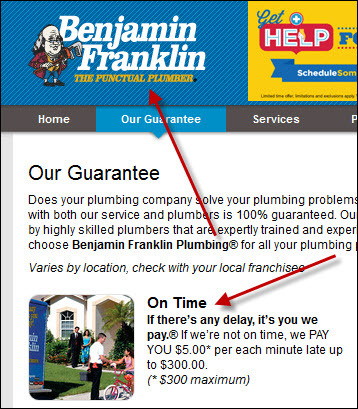 Benjamin Franklin plumbing devotes an entire page to satisfaction conviction. This plumbing business offers the typical 100% guarantee but goes much further. Firstly their punctuality promise is backed up with a guarantee that they will pay you $5 for each minute they’re late. In addition, they guarantee repairs for two years and describe the quality of plumber you can expect to enter your home. It’s really powerful stuff. This approach is an effective way to position the business as trustworthy, skilled and reliable. And instead of making an empty promise about punctuality, they literally put their money where their mouth is. Would you give them a call? Here’s another great example of effective satisfaction conviction in action. ActionCOACH cleverly shows potential buyers how their coaching investment will pay for itself. 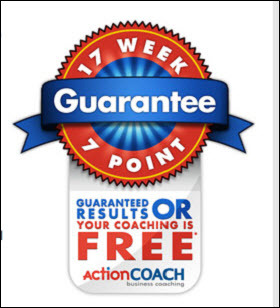 They promise, “You’ll be able to “Find our Fee” in your business within 17-weeks of ActionCOACH coaching your company… or your coaching is FREE”. This promise of tangible results in this satisfaction conviction reassures a potential client that their investment will be worth it. 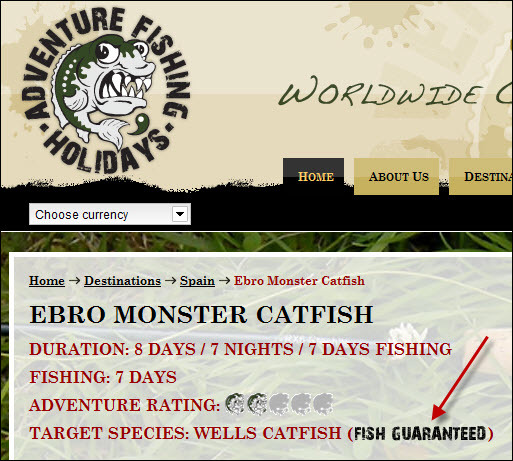 Adventure Fishing Holidays created a triple guarantee that not only promises on price, but also on the experience that customers are signing up for. Namely if you don’t get to catch one of your target big fish (displaying the fish guaranteed” icon), you can get the same holiday again for free. Good use of satisfaction conviction will remove a customers objection. Let’s say you’ve persuaded someone to read your copy. 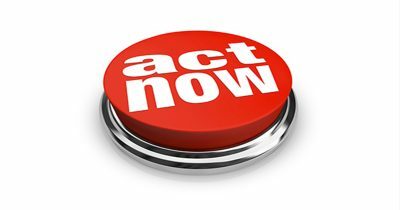 They’ve arrived at your call to action but are left with a few niggling doubts which are preventing them from buying. If you create a satisfaction conviction that overcomes these doubts, it could be just what an undecided customer needs to read to be persuaded to buy. By promising to pay for each late minute, suddenly that promise seems far more real. There’s more trust, the customers concerns are answered and the sale is more likely to occur. ActionCOACH prospects may be sceptical. Perhaps they’re worried about wasting money on coaching that doesn’t work and they’re reluctant to invest time and effort on something that may not pay. But with the promise of guaranteed results, those fears are removed and the coaching transaction is more likely. Vacationers are weary of getting ripped off and Adventure Fishing Holidays do a great job at allaying those fears. They deal with the price objections and then go one step further by guaranteeing the fishing experience too. Most businesses guarantee their work but they don’t promote it. Let’s say you’re a copywriter. If a customer were really unhappy with a job that you did would you charge them? Or would you do whatever you could to make that relationship right? A satisfaction conviction takes that approach one step further by communicating it up front for all to see. That said it’s worth checking out where you stand legally and of course never promise something you’re not totally confident you can deliver. Do you offer a satisfaction conviction? What impact does it have on your business? Have you been tempted to buy from someone because of the guarantee they offered? Please share your thoughts with the Daily Egg community. 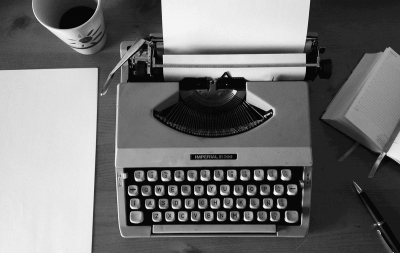 Georgina El Morshdy is a UK based freelance copywriter and content marketing specialist. She’s also the editor of the Micro business Hub, an online magazine that publishes ideas to help micro businesses grow. To learn more about how to use the right words in your business, follow Georgina on Twitter, or read her Copywriting Gems Blog.